Generating enhanced Quick Views is done using third-party components. Before you can build or rebuild sources to include enhanced Quick Views in the index, you must install these components on your Coveo server. Using an administrator account, connect to the Coveo server where converters are running. By default, the converters are running on the Coveo Master server, but they can also be running on Coveo Mirror servers and dedicated Coveo Remote Converter servers. You must perform this procedure for each Coveo server where converters running. Download the LibreOffice installer (version 4.1+ is required). Run the LibreOffice installer, and then note the path where it is installed. Download the PDF2HTMLEx archive file. Decompress the PDF2HTMLEx archive file on the Coveo server in a path accessible to the user that runs the CES service. Example: Decompress the PDF2HTMLEx archive in the C:\Program Files\PDF2HTMLEx\ folder. Access the CES Administration Tool (see Opening the Administration Tool). In the navigation panel on the left, select Converter Managers. 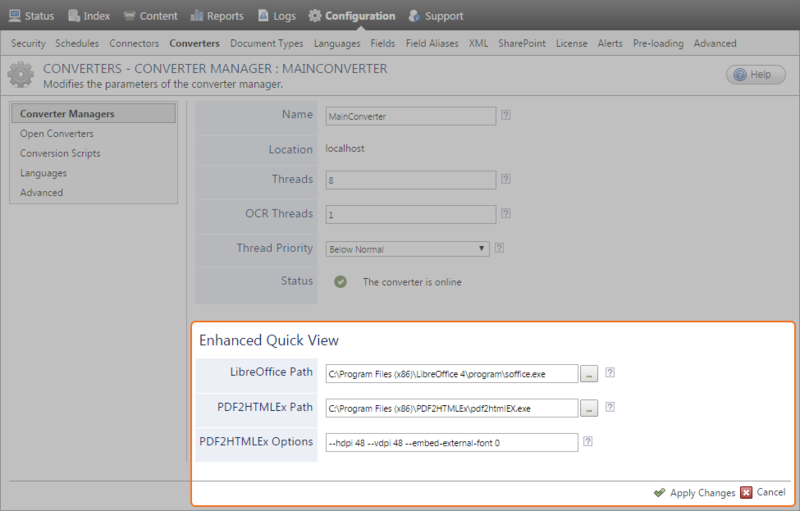 In the Converter Managers page, in the Converter Managers list, click the converter for which you want to configure the enhanced Quick View. Optionally, when you want to customize how the PDF2HTMLEx component operates, in the PDF2HTMLEx parameters box, change the command-line parameters that are passed to the PDF2HTMLEx executable for the Quick View conversion. Try adding --embed-font 0 to disable font embedding and save about 100 KB per document. In the best case you may loose markup such as bold and italic, but in the case of a foreign language the whole document could be unreadable if the end-user computer does not have an appropriate font. Try adding --hdpi 36 --vdpi 36 to further reduce the horizontal and vertical image resolutions expressed in dot per inch (DPI) when you can accept a little loss of image rendering quality. Try adding --process-outline 0 --optimize-text 1 --embed-outline 0 --printing 0 to save about 20 KB per document. Leaving the PDF2HTMLEx Options box empty will use the default values for all PDF2HTMLEx options. You can get the complete list of command-line options by running PDF2HTMLEx.exe -h in a Command Prompt window. The following table provides a subset of PDF2HTMLEx command-line options that you can use to optimize the Quick View rendering quality versus file size. Consider creating a new document type set for the enhanced Quick View (see Creating a Document Type Set). In the selected document type set, configure each file format for which you want to use the enhanced Quick View (see Modifying How CES Handles a Document Type).